Summertime often leads to more frequent outdoor parties, barbecues, picnics, potlucks, and other gatherings where food that you can eat with your hands is ideal and food that is easy to prepare is even better. When it comes to the dessert, it doesn't get much better than bars - bake them in one pan (foil-lined for easy clean-up), stack them neatly in a container for easy transport, and eat them with your hands. It helps when said bars are bursting with summer flavours of berries, fruits, and lemon! Here are my top 5 favourite summertime bars right now. What are yours? 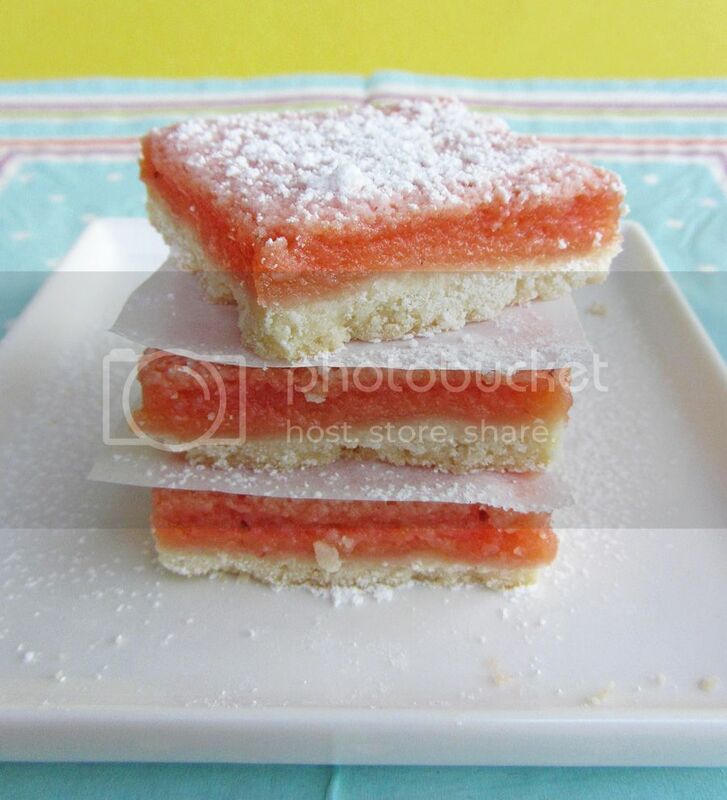 Strawberries and lemons combine here to make a sweet creamy filling atop a buttery shortbread crust, and dusted off with a bit of icing sugar. It doesn't get much more "summery" than strawberry lemonade, and even if you can't find fresh, local strawberries anywhere right now, these are still delicious with the strawberries from the grocery store. Plus, they're super easy to make and look so pretty - they'd be great for a pink-themed party like a baby shower! These bars have been hugely popular all over the web lately, and if you use Pinterest then you've most likely seen them once or twice before. A lot of people call them "lemon brownies" but they have much more of a cake texture than a brownie texture, so I prefer to call them lemon cake squares, because that's exactly what they are - squares of lemon cake with a thin layer of lemon icing. Whatever you want to call them, these are delightful! If you like lemons and you like cake then you will love these. I brought nine leftover squares to Ryan's work and he said they disappeared immediately with one person asking for the recipe for a party she had coming up. I've read a lot of similar comments from other people who've made them and said they were a huge hit. If you haven't tried these yet, give them a shot! This is another recipe that has appeared a lot in the blogosphere over the last year, and though the previous recipe was far from a brownie, this one is everything a brownie should be - rich, fudgy, with a deep chocolate flavour from real chocolate - but with a summery addition that makes them extra special! 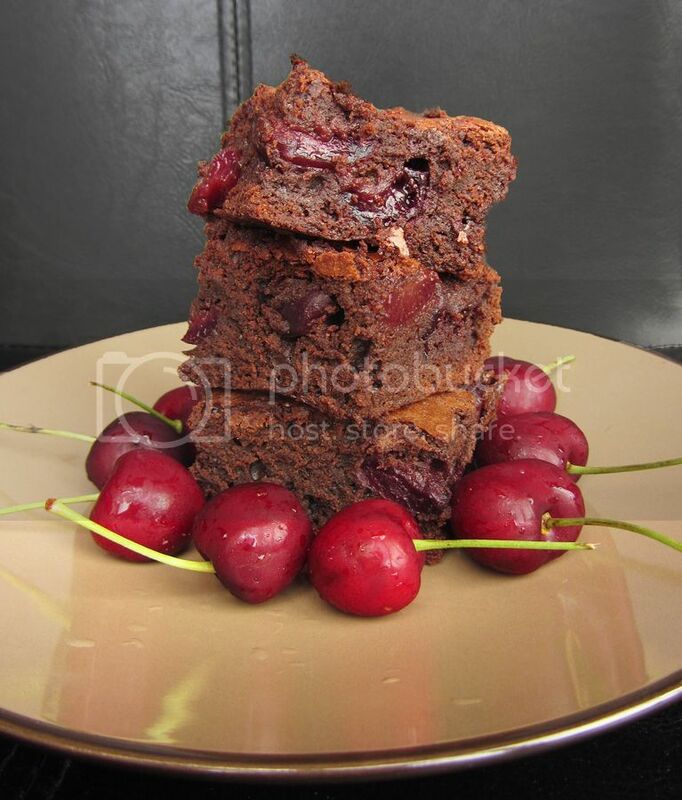 Adding roasted cherries to the brownies gives them such an unexpected sweet burst of flavour to cut through the rich chocolate, and though I'm not usually a brownie or chocolate lover, I loved these! I made these during peach season last summer and am itching to make them again this summer. They're like a sour cream pie (which I much prefer to regular fruit pie) with fresh peaches and spices, a shortbread crust on the bottom and a crumb topping, cut into convenient little squares! These originated from a recipe for blackberry pie bars from Pink Parsley, which may look even better than the peach version! 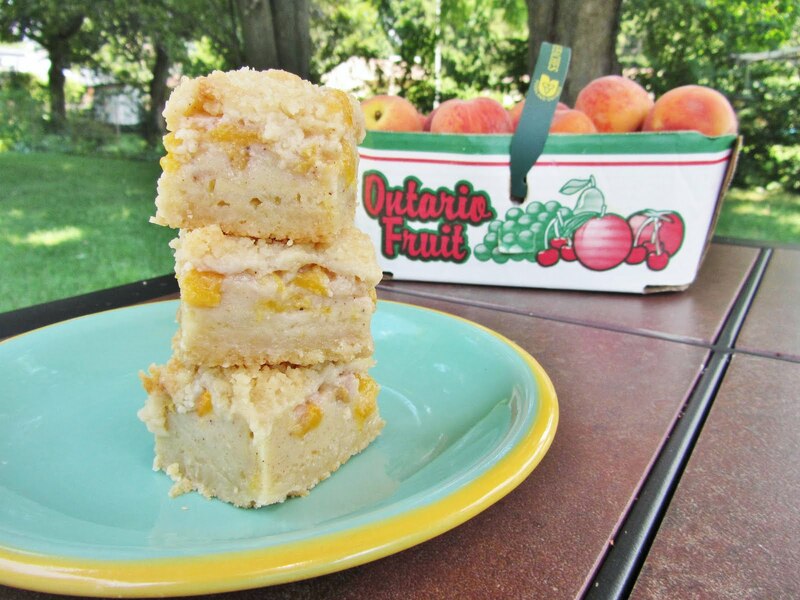 Get the recipe for peach pie bars from Once Upon a Cutting Board, adapted from Pink Parsley. Note that I cut mine in half so the filling was higher than the original, but next time I'd use the full recipe so they look more like the beautiful bars on Pink Parsley! 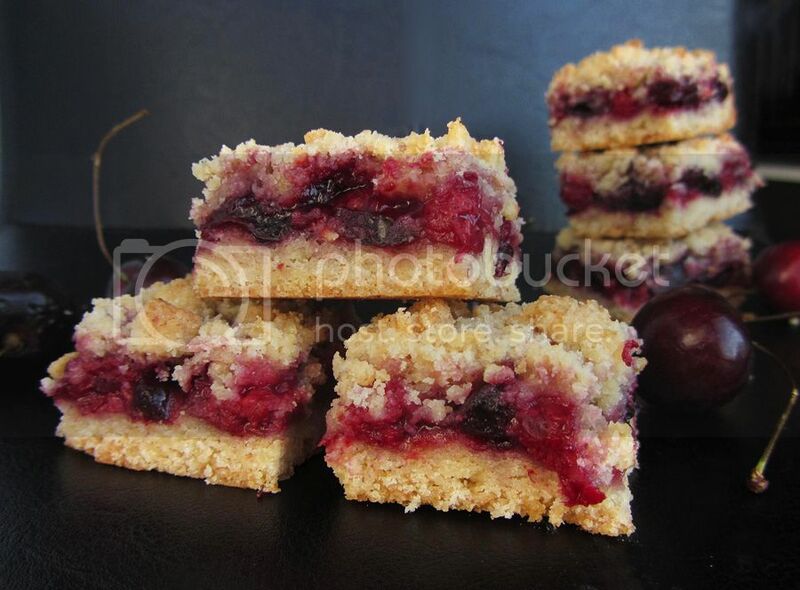 When in doubt, you cannot go wrong with a classic buttery crumb bar filled with sweet fresh fruit or berries. In this version, I combined fresh cherries and raspberries for a gorgeous red filling that was bursting with flavour! I loved the combination of cherries and raspberries together but I think these would be equally tasty with peaches, blueberries, blackberries, or a mixture of any of them together! The next time I make these I think I'm going to try peaches and blueberries together. Ooh, you had me at Strawberry Lemonade bars. 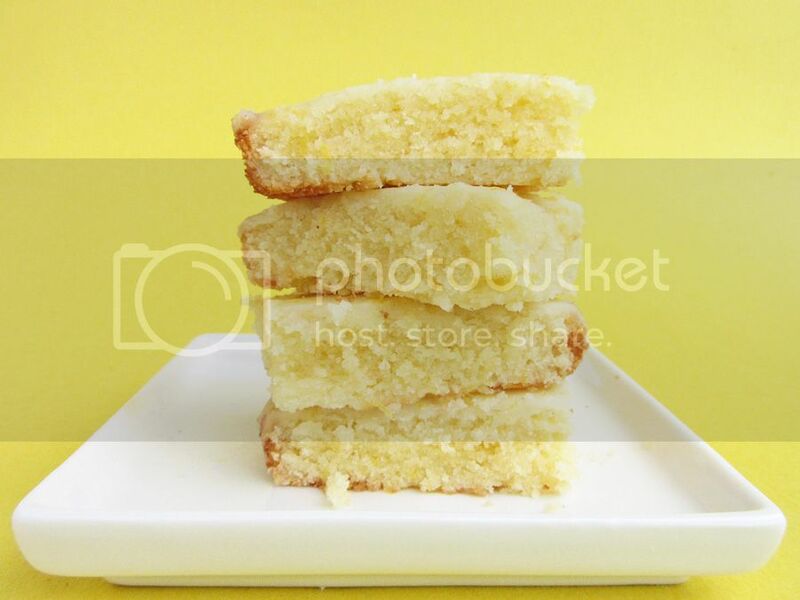 :) Lemon bars are one of my favorite desserts--that sweet/tart/creamy combination is just perfect. Of course, all the others look delicious too! holy smokes show these all look incredible! I want. All of these. Squared. Feel free to make any of these again - I would be happy to eat any of them! 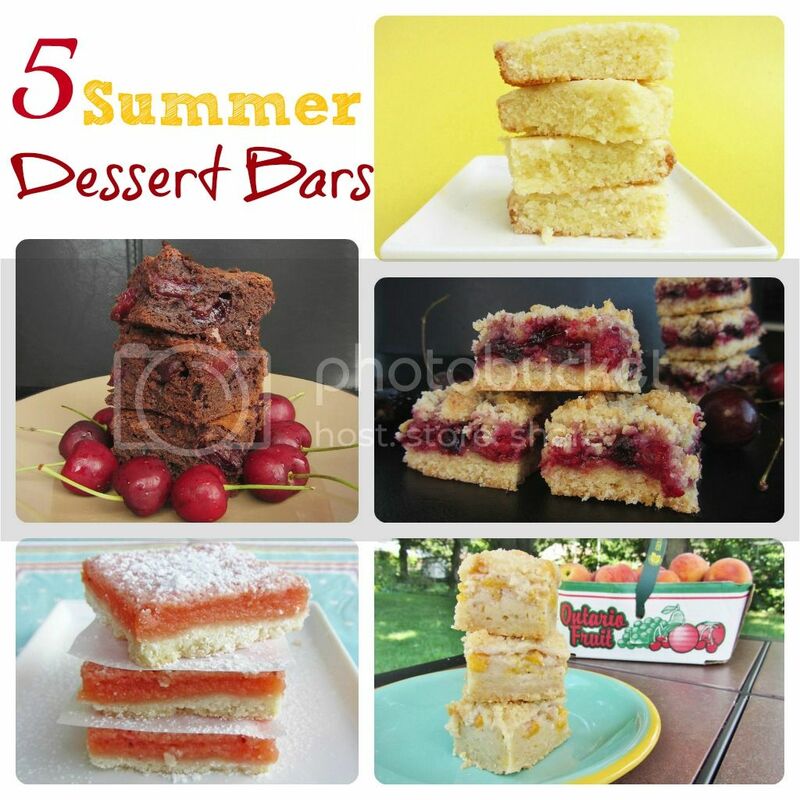 Although I think I'd choose the strawberry lemonade or the peach bars first...I love lemony desserts, and sour cream is so perfect with fruits to create a creamy pie filling - yum! Roasting cherries is a great idea. It's so refreshing to see cherries in a dessert that arent drenched in sugar and syrup. Thanks for this!